Raffi Cavoukian warned us. He warned us about the dangers of capitalism, the robot apocalypse, climate change, and most of all, the rise of fascism in the Trump era. Have you been paying attention, or are you still just humming “Down by the Bay” like a fool? We’re in an era where our childhood heroes are being exposed as deeply evil, morally absent monsters and abusers by the day. Hungry for something pure in this god-forsaken world, I wondered what the 70-year-old folk singer behind “Bananaphone” and “Baby Beluga” was up to. In short, we never should’ve stopped listening to him. Raffi has been an activist since decades before the #resistance took hold, and he’s still got a lot to say. 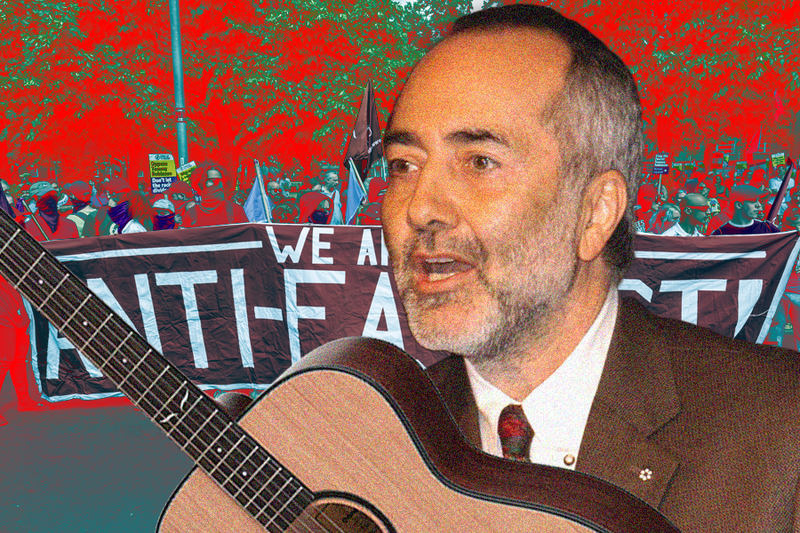 In 2015, Canadian newspaper the National Post profiled Raffi’s political posting on Twitter, snidely remarking, “Artists with pre-pubescent fan bases usually try to keep partisan politics close to the vest.” Raffi has done the opposite. Since 2015, he’s only doubled down, and though he lives in Canada, he frequently posts about U.S. politics, using words like “bigot” and “fascist” to describe the president. He frequently uses #FightFascism as a tag in his GOP-critical posts. FED UP with fascism. you too? In a Facebook post, he mentions turning down licensing requests to use his music in commercials (one for baby food, another for a national streaming service) for the same reason. He doesn’t seem to need the marketing, either. His Facebook page is filled with comments of parents recounting stories of their own childhood with Raffi’s music, and how they’ve continued the tradition with their offspring. One such dad is Chris Edwards, a child welfare worker in Nova Scotia. Edwards was born two years before Raffi’s first album, Singable Songs for the Very Young, was released in 1976. “As a kid growing up in Southern Ontario, Raffi was just part of the culture,” he says. In a 1992 Washington Post profile, Raffi says he’s “heard the urgency of the Earth’s cry.” He cites pollution and overpopulation for the reasons he “will not bring children [of his own] into the world.” The piece paints his interest in the climate as possibly a marketing pivot — his likely next chapter after making music. But Raffi has done both, releasing new albums and staying true to his mission to help the planet. One Raffi dad I spoke with says the environmental message still resonates. Sean Clayton, in Toronto, tells me, “About a decade or so ago [Raffi] was working closely with [environmentalist] David Suzuki to cut down on greenhouse gases,” and mentions the 2007 song “Cool It,” written about global warming. Did you know Raffi wrote a book about the dangers of the internet? It’s called Lightweb Darkweb, and it was released in 2013. In an excerpt published by HuffPost, he talks about confronting a well-known futurist in 1995 after listening to him talk about digital sunsets captivating children. Writing about the dangers of the internet, Raffi warns that not everyone working to build the web wanted to bring the world closer together. “[S]ome were dazzled by the chance to alter reality. By a chance to play God,” he noted.